Thunderbolt Casino is a new RTG online casino that has become extremely popular with a lot of South African online casino players. They offer a download casino version for your PC, an Instant Play version which you can play in your PC’s browser, or you can play on any newish smart-phone or tablet. In my opinion the download casino version, which you install onto your PC, is the better option as you then have access to the full range of casino and slot games and also access to the Slots Tournament section. You can access all versions of the casino with one account, so if you’re on the move you can still play your favourite Thunderbolt Casino game on your mobile device. Wagering requirements are 60 x bonus (R6,000) with a maximum cash out R500. Valid only once per new player, per household. * ULTIMATEFLASH bonus has a withdraw limit of 5 times the redeemed amount and a 60 times play through requirement. Watch the video below for the current hot promotion running at Thunderbolt Casino. 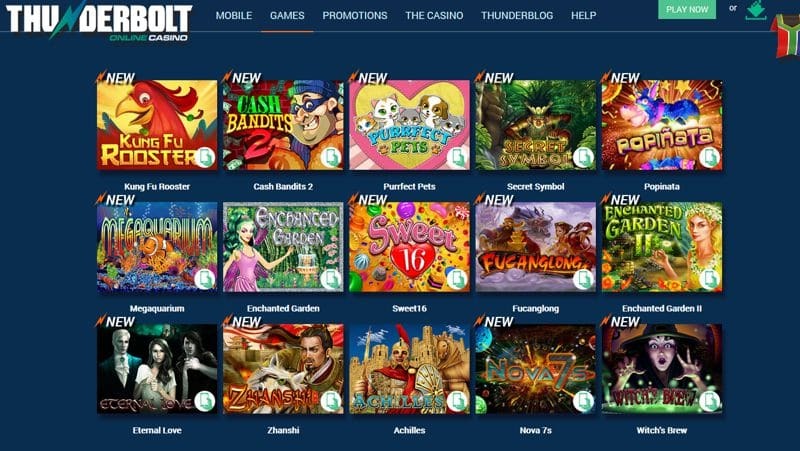 Thunderbolt Casino use the renowned Real Time Gaming (RTG) casino software has a wide variety of casino games which cover Progressive Jackpots, Video Slot Games, Video Poker and table games which include Blackjack, Roulette, Tri Card Poker and many more. Join in the action with their weekly and monthly Slot Tournaments which are very popular amongst online players. Thunderbolt Casino is a good place to play at. The casino may be new but the management behind the scenes are professionals and know how to run all aspects of their casino professionally. Customer support is also top notch. They offer telephone, email and live chat support. Their toll free number is 0-800-980-320. Email and live chat is available via their casino support page.